The Edge Cloud is an off-site storage option for your Edge practice management and imaging data. This approach offers many advantages compared to maintaining servers in your office. Your Edge data is secured in a private SAS-70 rated facility which also manages data for large financial institutions and insurance companies. In other words, secure. Redundant data entryways are protected by world-class anti-intrusion firewalls, and backups are saved on multiple platforms. 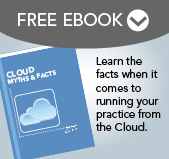 With the Edge Cloud you have access to your practice data from anywhere on any platform. Redundancies in hardware and Internet paths mean any single failure isn’t a problem. There are two major highways to your data. Even if your Internet access goes down temporarily, you can access data via cell-based network cards and routers. A local network does have a speed advantage moving data from the server to a workstation. But that gap narrows with a properly designed application like Edge. Text transfers quickly and Edge retains a local copy of images which greatly improves access speed. Even when loading an image for the first time, Edge quickly pulls and displays a thumbnail version, and then fills in the detail in the background while you work. With the Edge Cloud, you don’t have to purchase, confi¬gure, and maintain complex network servers, nor do you have the cost, time, and worries of creating your own data backups. Your initial and ongoing hardware costs are significantly lower. An Ortho2 network is 35%–44% less initially for typical practices, with similar reductions in ongoing expenses. The Edge Cloud does require a usage-based hosting fee, but this is more than offset by other savings. A lot of the heavy lifting for Edge takes place in the cloud, but your local computers do still play a role and should have reasonable specifications. Review the recommended guidelines below for both PC and Macs. For specific Edge Cloud System Guidelines, select a link below.